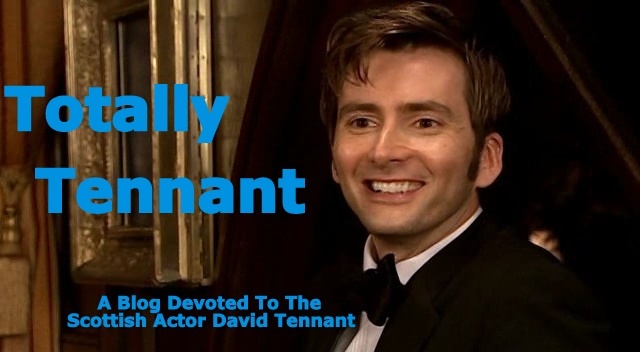 Find out when David is on TV or radio on the Totally Tennant Calendar at the bottom of the page. David Tennant's appearance at the birthday party of Peter Davison's young son stunned the children in attendance - apart from Davison's own. Former Doctor Who actor Davison, currently starring in ITV1 drama Unforgiven, told Digital Spy: "My son Louis had a birthday party and Georgia [Moffett, Davison's daughter] was coming to his party and she turned up with David Tennant, and every other child in the garden was [shocked] - but my children were like 'I've met him before'." Davison, who shared the Tardis alongside Tennant in the Children In Need special 'Time Crash', explained the reaction: "Well, they don't know any other world in which their dad is not in Doctor Who, so they're not as impressed as their friends are. We had David Tennant around... and they were almost unimpressed with him, I have to say! That was really extraordinary - it was almost like he didn't exist, it was very weird." Does this mean David and Georgia are dating? Or, is he a friend of the family? It could be either way, but we'll never know because David never talks about his love life. Hamlet with the prince has turned out to be even better than Hamlet without the prince – and that is quite something. Gregory Doran's RSC production at the Novello Theatre has been one of the best events London theatre has seen in years. It came to the capital a month ago, with enormous expectations centring around its megastar, DavidTennant, of Doctor Who fame, and opened without him. So we had Edward Bennett, shot from Laertes to play the Great Dane, becoming an overnight star, while poor Tennant, nursing a back injury, seemed forgotten. But he came back for the final week's run, and lifted an already superb production to sublime heights. This is a Hamlet that we will talk about for years. Tennant's Hamlet is quite different from Bennett's, but then it is also different from any other Hamlet. Tall and incredibly thin, he is like a rubber-man, bending himself into impossible shapes, his astonishingly mobile face expressing emotions from mockery, shock, anguish and madness within a single scene. He almost mutters some of the greatest lines in the English language, and throws others away so casually that it is hard to remember this is really Shakespeare. He gets laughs and he gets tears, and his soliloquies, which he delivers as deep, probing analyses of his soul, are spellbinding. Doran set out to make Hamlet a thoroughly modern and relevant play, and he succeeds. Tennant's prince is a familiar figure to most of us: a depressive who cannot cope with his life and responsibilities, highly intelligent and utterly self-centred. It is all about the "me", and he couldn't care a fig about anyone else, including his mother (played beautifully by Penny Downie), while poor Ophelia (Mariah Gale) is a plaything. Polonius (Oliver Ford Davies) is a prating old fool whom he treats with utter disdain, dragging his corpse off-stage and gleefully hiding it as if it were a game of hunt-the-treasure; only Patrick Stewart (who doubles as the Ghost) as Claudius has his measure, showing him that he has seen through his assumed madness. Bennett, back as Laertes, brings a new dimension to that role, and he can feel pretty satisfied with what has been the most eventful month of his life. If Tennant had not returned, his Hamlet would have been rated close to the top. He did 21 performances, and at one stage it seemed likely that he would complete the run. As it is, we got two Hamlets, one good, the other great. I wish I could have seen David's Hamlet. I'm still hoping for a DVD. Vote for David for Most Attractive Man of 2008 at www.hellomagazine.com. You can vote more than once, but you must wait 10 minutes between votes. Voting ends on January 20. He's currently in second place. Twilight's Robert Pattinson is 1,700 votes in the lead while Hugh Laurie is running a distant third. David returned to Hamlet and I missed it! I've been sick with the flu since last Saturday so I've been playing catch up on all the latest news. According to the BBC, the RSC has been making daily postings about David's appearances since his return is being assessed on a "day by day" basis. I also found out that "the RSC came very close to securing a deal to ensure the production was recorded professionally for TV and DVD - but that the plans fell apart, after lengthy negotiations." What a shame! What I would give to be able to get this on DVD. I'm sure the RSC could make a boatload of money from the massive amount of people that would buy it. David Tennant's triumphant return for the last week of performances of his RSC Hamlet proves his tenacity. The Dr Who star faced down snipers and doubters when he first returned to Stratford, and the company where he first made his name, to play the Dane last year. Invalided out of the sold-out London run by a severe spine injury, he could just have kicked back and convalesced. But whether or not his back is better, Tennant is back, and his performance is better than ever. There is a core of truth to this Hamlet with which Tennant only occasionally loses touch. He plays the prince from the start as an unstable man-boy, sharp but prone to mood swings and histrionics. He’s a case of arrested development, clearly unfit to rule and smart enough to know it. This makes brilliant sense of Hamlet’s inability to avenge his murdered father, or feel lasting remorse for Polonius’s murder or Ophelia’s death, because everything is always about him and his shortcomings. The lithe, manic physicality of Tennant’s performance hasn’t been affected. Last night I still found some of his early anguish forced and his later “madness” close to Time Lord showboating. But in the soliloquies he is magnetic, rightly confident of his ability to make an audience share his pain, while also being one of the wittiest Hamlets I’ve seen. And it seems bitchy to quibble in the face of Tennant’s commitment to Shakespeare, and the new audiences he must surely have brought in. He’s supported here by an excellent cast including Patrick Stewart as a silkily conniving Claudius and Edward Bennett, the understudy who covered for him, now back in the role of Laertes. Gregory Doran’s production is full of detail and nuance, while still delivering all the bombastic flourish — dry ice, chandeliers, frocks! — typical of the RSC. But this is David Tennant’s show. I hope he, and those lucky enough already to have tickets for the last few performances, enjoy it. Until 10 January. Sold out: queue for returns on the door. 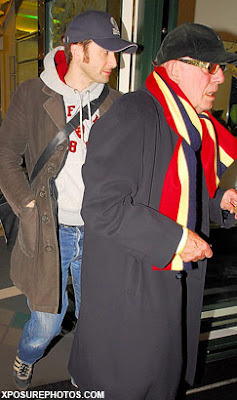 The following picture of David and Richard Wilson leaving The Ivy at 1AM is included in the Nick Curtis review. It's so wonderful that David's recovery has been going so well. It makes me very happy! Castrolvalva is still in the process of uploading part 4 as I write this. Thought I'd get it up as soon as possible since it may not be available for long. I found a preview of tomorrow's special. It looks like David is going to be interviewed. BBC One has announced that the Eleventh Doctor will be revealed tomorrow in a special Doctor Who Confidential. The show will be broadcast at 5:35PM GMT, which is 12:35PM ET. I assume there will be something about David in this show, along with the previous 9 Doctors. I'm hoping there will be an interview with David. I'd like to see his comments about the actor to follow him. I remember when David replaced Christopher Eccleston and I didn't like him leaving. This time it's even worse. David is THE BEST Doctor of them all. David's Doctor is going to be a tough act to follow.